After listening to Prosecuting Attorney Robert McCulloch so announce last night and as Ferguson erupted into riots, fire, and looting, the main question in my mind morphed from how could this violent cop go free to why choose 8:15 in the evening to drop a bomb on a wounded community. First was my understanding that Wilson did not provide any statement immediately after he killed Michael Brown. Not giving a statement would permit Wilson to consult with lawyers before speaking to the grand jury and to conform his testimony to the forensic evidence – especially the autopsy findings. It would violate every police guideline regarding proper procedure after an officer is involved in a shooting. If Wilson didn’t speak in the hours after killing Michael Brown, then nothing he said would be credible to me. Other factors causing me to believe Wilson used excessive force included statements by eyewitnesses Dorian Johnson and Tiffany Mitchell. Both said Wilson shot a non-resistant Michael Brown. This description seemed corroborated by the autopsy finding that one of the many bullets Wilson fired went through Michael Brown’s right hand suggesting his hands were raised in surrender. But, as McCulloch spoke, my confidence in Wilson’s guilt was shaken. Contradicting my previous belief that the officer hadn’t spoken on the record after the shooting, the P.A. referred to a statement Wilson gave to investigators the day after he killed Brown. McCulloch also said that numerous witnesses described the kill shots as coming only after Brown “charged” Wilson. The P.A. noted several times in passing that virtually all the evidence the grand jury considered would be put on line. Various pundits have attacked McCulloch for criticizing social media, his explication of various witness statements, and for saying that the witnesses whose testimony was most inculpatory changed their stories after the publication of the autopsy reports. But, I understood exactly what he was doing. McCulloch was saying to those of us who had judged Wilson guilty, don’t be so sure. Take another look at the evidence. It may not show what you thought it did and, if it doesn’t, then the decision not to indict may well be justified. Others have challenged McCulloch’s decision not to ask for an indictment but rather to call numerous witnesses to testify and dump documents on the grand jury. But I get this too. McCulloch, who has the reputation of being a cop’s prosecutor, clearly didn’t relish prosecuting Wilson. Perhaps, he should have recused himself for this reason. Still, if he did not believe that there was probable cause to believe Wilson committed a crime then ethically he would be precluded from asking the jury to indict. On the other hand, because of the extremely high profile nature of the case and questions surrounding the shooting, it was appropriate for a panel of community members to make the call. The New York Times has published online all of the documents released last night by the prosecuting attorney. These contain, as far as I know, nearly everything presented to the grand jury. There are thousands of pages of testimony and dozens of photographs and other documents. I have reviewed a tiny number of them and confirmed that police questioned Wilson the day after he killed Brown. The documents I have read seem to corroborate what McCulloch said last night. I want to be clear. Although I strongly suspected that Darren Wilson murdered Michael Brown or, at a minimum, used excessive force when he shot him to death, I now have sufficient doubts to accept the grand jury’s decision. But, I have not closely examined all the materials or reviewed all witness statements. It may well be that an indictment was warranted and a conviction ultimately could have been obtained. Two facts strike me as somewhat inculpatory: One Wilson’s toxicology screen was negative for narcotics and alcohol but his blood showed a high level of creatinine which is a by-product of creatine – a compound that bodybuilder’s take to help build muscle mass. One side effect of creatine is increased anger. I wondered as I saw this finding whether Wilson was in a chemical-fueled rage when he shot Brown. The second fact that cut against Wilson was that only a minor injury was observed in the aftermath of his encounter with Brown. The picture taken of his face at that time shows only slight discoloration of his cheek even though the officer told investigators that Brown punched him twice. The Brown family’s attorneys will no doubt closely review every document and witness statement in preparation for a civil suit against Darren Wilson and the Ferguson Police Department. Given the lower standard of proof, such a case may well succeed. Robert McCulloch may not have mishandled the prosecution of Darren Wilson. But his decision to announce the grand jury’s decision at night after a crowd of increasingly anxious and restive young people had hours to gather in Ferguson was disastrous. Compounding the problem, by waiting, authorities assured that community members most likely to exert a calming influence had long vacated the area and very unfortunate and perhaps avoidable rioting and vandalism played out. What could have been done differently? The announcement could have been made as soon as the decision was reached in early afternoon. McCulloch could have included in the release that he would speak the following morning. Alternatively, the announcement could have been postponed until the following morning. In the first instance, some rage might have dissipated as people came together after learning that there would be no indictment. Moreover, the additional anger that McCulloch’s speech instilled in some would not have come until the following day. Either way, a day-time announcement would have meant a more mixed crowd including older and perhaps cooler heads and families. This might have kept the protest peaceful. Ultimately, my sense is that officer Wilson made some bad decisions that resulted in his being in a situation where he may reasonably have feared for his life. Under this interpretation, Wilson should not have killed Michael Brown but, perhaps, should not face criminal charges either. Regardless, Robert McCulloch needs to explain exactly what led him to make an explosive announcement at the most combustible time. The use of the term “Blacks” is a bit pejorative. Barbara – I don’t think the word “blacks” is in the post. Perhaps you’re referring to Shade’s post in talkback. Shootings of Black men are not all the fault of the cops. While it may be true that a greater percentage of Black young men get ​shot by police, I would suggest that the cause of this is not solely racism on the part of the police. Instead, at least to some extent, this can be explained by the fact that Black young men often have less hope & opportunity in our society, & thus for self-validation, many seem compelled to engage in high-risk behaviors that others not in their shoes can’t comprehend and that they are not culturally attuned to. There is also the fact that many Black men are big and muscular, and thus imposing figures to White men. While it might seem raciest to say this at first glance, one has to remember that during the time of slavery, Blacks were often selected and bred for such characteristics, and less hardy men might not even survive. Cops who feel that they have a physical disadvantage during an altercation are naturally going to reach for an equalizing weapon more quickly, and the most versatile and effective equalizing weapon a cop has is his gun. I’m sorry if any of the above offends anyone, but to work out our country’s problems between the races we need honesty, not political correctness. The job of a cop is to accept & handle those challenges that come along during the day. While backup is available when really necessary, chronic staffing shortages in most departments means cops can’t be calling for backup every time a small incident occurs (such as when a cop observes a someone jay-walking down the middle of the roadway). Officer Darren Wilson simply told Michael Brown to get out of the middle of the roadway, but instead of complying, Michael walked up to the officer’s open car window & confronted the officer. After exchanging some words, Michael punched the officer in the face and blocked the officer’s exit from his vehicle, making it difficult for Wilson to defend himself from receiving a further beating. To regain control of the situation, Wilson pulled his gun. However, Michael was still in a controlling position and he too went for the gun. This further escalated the situation and forced Wilson to shoot. After being superficially wounded, Michael then attempted to flee. Wilson understandably gave chase, as he didn’t want the perp to disappear (and hopefully Wilson was equipped with a hand-held radio to call for backup). After being chased for a short while, Michael surprised Wilson again by turning around and running straight at him. This action (& Michael’s alleged motions towards his pants waistband possibly just to pull up his pants that had slipped downward while running) suggested to Wilson that Michael was charging with a weapon. At this point Wilson fired his gun again, but this time the gun misfired several times and other shots missed. Michael was not deterred and kept charging, so Wilson kept shooting until finally a bullet hit Michael in the head & felled him dead. The forensic evidence and some eyewitness reports apparently support this timeline & explanation of events. Although I’m sure Darren Wilson would accept a do-over if he could do so with 20/20 hindsight, I disagree with anybody that suggests that Wilson could have reasonably been expected to act any differently given the realities and training today’s generation of cops work with. People expect too much of our cops. Most earn between $50 & $100k. For that money, they chronically must deal with revenue induced staffing shortages, rotating hours, extended shifts, mandatory overtime, working holidays, frequent disruptions to a normal family life, stress, sleep deprivation, and very serious danger. Some feel the need to “bulk up” on hormones to give them a physical advantage, but this often results in further psychological stresses. Most are not academic types with a college degree, rather they are simply ex-jocks that were smart enough to figure out that they can make more money in law enforcement than by working at Walmart. Much of what we like to blame on our law enforcement officers is really just societal ills that we should be blaming on ourselves. 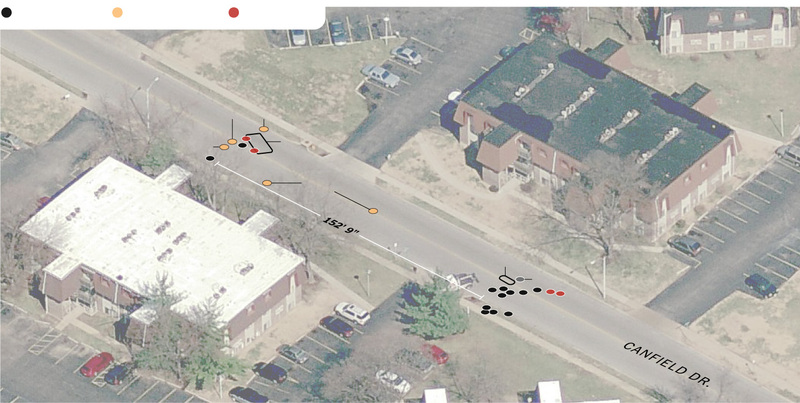 Hey Hal FYI, bullet casings shows that Darren Wilson was only a few feet to 10 feet away from Michael Brown when he shot him and blood stains on the road show that Mike Brown reversed his direction and traveled 15 feet back towards Darren Wilson police car. Officer Wilson did what most any currently working cop is trained to do — retain control of the situation & don’t let things snowball out of control to where he or others might get hurt. People who say Wilson should have acted in any other way have been watching too many episodes of Andy Taylor policing Otis & the citizens of Mayberry. One of that show’s charms was that even back then, real cops didn’t act in the way that Andy supposedly did (and this fact was highlighted in many episodes by Andy’s run-ins with “big-city” cops). The realities of the street today are certainly nothing like the imaginary Mayberry of the 1960s. Tell us what Wilson did wrong Hal. Was he supposed to call for backup just because two kids were walking in the roadway? Should he have let Brown punch him again through his open car window without going for his gun (& perhaps instead spend time searching for a less effective weapon that unlike the gun, was not on his belt)? Should Wilson have cowered in his car after superficially wounding Brown & let Brown run away? When Wilson gave chase, Brown turned around after a short while and charged him. Should Wilson have let Brown tackle him? Brown was using Wilson’s reluctance to shoot against him. Any cop that allows this to happen is likely to either get themselves killed or get fired to save lives. The Brown shooting, though tragic, is very simple to understand. It falls into the category of “suicide by cop”. If you sucker-punch the man with the badge and the gun, you are taking a high risk of getting shot dead. I’m not buying all that Fred says either about how he would have handled this & many other recent police incidents in the news. That man is very opinionated & judgmental. Worse, Fred seems to have a very short fuse before he gets all red-faced angry & cruel even to his friends. Plus Fred holds grudges. If you sucker-punched Fred in the face while on-duty as a cop, I have no doubt he would pull his gun. I am therefore convinced that Fred too would have ended up in the same predicament as officer Wilson. In regards to the recent Salinas lettuce-knife holder shooting, you can’t let a man go from an isolated area (where he was) into a public area (where he was heading) while wielding a lettuce knife and acting all crazy. That man needed to be stopped before he got to where an innocent member of the public might have been taken as hostage or hurt. If someone did get hurt & it later came out that the police had an opportunity to stop the man before that happened, the city would have been open to a lawsuit due to their failure to take appropriate action. You are an ex- D.C. city attorney Hal, you know better.